The easy-to-use AskCHIS Neighborhood Edition, or AskCHIS NE, enables users to customize searches, compare and “pool” small geographic areas, and map and chart their results. AskCHIS NE covers a wide range of health topics, including rates of health insurance, chronic conditions like asthma and diabetes, and behaviors like smoking and physical activity; quality of children’s health; and access to health care and mental health care; and much more. 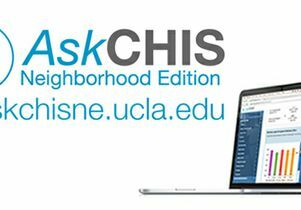 AskCHIS Neighborhood Edition is a service of the center’s renowned California Health Interview Survey, the nation’s largest state health survey. An existing companion web tool, AskCHIS, allows users to find health data at the county, region and state levels. AskCHIS NE drills down even deeper than AskCHIS, allowing users to quickly find health disparities within specific cities or legislative districts. Using the system’s pooling feature, hospitals can build health profiles of their service areas, combining ZIP codes or cities. Community groups can decide which programs to offer at parks based on a neighborhood’s specific health needs. Journalists can compare obesity rates in neighborhoods they cover. Log onto http://askchisne.ucla.edu. People who have previously used AskCHIS can use an existing logon ID and password; new users can create a free account before logging in for the first time. Select a topic from the panel on the left. Search for geographic areas of interest and click the “Create a table” button. The search results are quickly displayed in a table, bar chart and interactive map. The interactive map makes it easy to for users to see health disparities across the landscape. Data for one ZIP code can be loaded and displayed, but the user also can zoom out to view adjacent ZIP codes or the entire state for comparison. As in AskCHIS, results can be easily exported into Excel spreadsheets. But AskCHIS NE also makes it easy for users to download the charts and maps for use in reports and presentations. The site also makes HTML coding available for use in online media. AskCHIS Neighborhood Edition is sponsored by grants from Kaiser Permanente and the California Wellness Foundation. Heavy website traffic is expected when AskCHIS NE launches. If the site is busy, please try again later. Visit the UCLA Center for Health Policy Research — and see a demo of AskCHIS NE — at Booth 1043 at the American Public Health Association annual meeting in New Orleans, Nov. 16 – 19. View our schedule for the meeting (PDF).